The New York City Department of Environmental Protection operates the systems providing over 3.8 billion liters of drinking water to the city every day. There are over eight million city residents, and the system also supplies another one million residents of upstate counties along the water supply system. The entire system can store 2.1 billion cubic meters of water in its systems of supply lines, reservoirs, and distribution lines. The water is distributed through a network of 10,600 kilometers of water mains. New York's water supply system is one of the largest in the world. But the treatment process is simpler than in most other U.S. cities. This is because it relies on multiple wilderness watersheds. Between 1997 and 2015 the city's Department of Environmental Protection has either purchased or used conservation easements to protect over 203 square miles (or 53,000 hectares). The system has the added benefit of being able to bring 95% of the total water supply to the city through gravity. The New Croton Aqueduct was completed in 1890. It still operates, bringing water from the New Croton Reservoir in Westchester and Putnam counties. It was the primary supply when it first opened, but the city's growth drove the development of two much larger supplies. 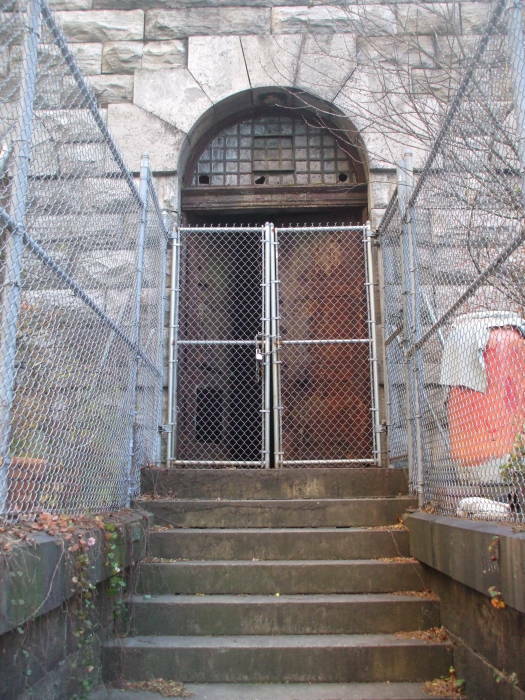 The New Croton Aqueduct now supplies about 10% of the city's drinking water. Its water needs more treatment, and a new filtration plant began construction in the Bronx in the mid 2000s. The Catskill Aqueduct was completed in 1916. It now supplies about 40% of the city's water, bringing it from two reservoirs in the eastern Catskill Mountains. It has several individual sections, for a total of 163 miles (or 262 kilometers). The Delaware Aqueduct is the newest, completed in 1945. It supplies about 50% of the city's water, bringing it from tributaries of the Delaware River in the western Catskill Mountains. It's 85 miles (or 137 kilometers) long, making it the world's longest tunnel. The water flowing from the Catskills through the latter two aqueducts first crosses under the Hudson River through tunnels up to 1,100 feet below the river bed. The water is first stored in the Kenisco Reservoir in Westchester County. From there it proceeds to the smaller Hillview Reservoir in Yonkers, much closer to the city. In the 1790s, New York was becoming the commercial center of the United States. This was happening under the influence of Aaron Burr and his long-term opponent and first Secretary of the Treasury, Alexander Hamilton. There were only two banks in New York then: the Bank of New York and a branch of the Bank of the United States. Both of those banks were controlled by Federalist merchants. They denied credit to Burr and other Republican figures. Burr realized that any new bank would need a formal charter from the New York state legislature. But because that body was controlled by Federalists, it would never knowingly approve a bank that would benefit non-Federalists such as Burr. Burr set up a water-supply scam. Manhattan's water supply was limited. The island didn't have much fresh water to start with. It is surrounded by brackish water. The Hudson River to the west is brackish in its lower stretch, as it empties into the harbor which in turn is open to the Atlantic Ocean. On the east of Manhattan are some bodies of water referred to as the Hudson River and the East River. However, they are really tidal estuaries connecting the lower Hudson, Long Island Sound, and the harbor. The population grew rapidly through the late 1700s. The city extended further and further north from the original Dutch settlement of Nieuw-Amsterdam at the southern tip of Manhattan. The limited fresh water sources including natural springs, wells, and cisterns became polluted or simply unavailable. The available water had offensive smell and taste, and was suspected of carrying disease. Yellow fever epidemics swept through the city. A larger yellow fever outbreak in 1798 led to demands for clean water. In 1799, the following year, Burr set up his scheme. Burr had his brother-in-law, Dr. Joseph Brone, propose that a private firm pipe fresh water from the Bronx River to the lower end of Manhattan. The city's Common Council adopted this proposal. Burr then had a committee of six prominent New Yorkers argue for a privatized solution. Due to the city's lack of funds, a private water company would be established. Burr's legal details included a large loophole. The Manhattan Company, the private water-supply business, was allowed to use "surplus capital" to buy stock or invest "in any other monied transactions or operations not inconsistent with law". All of this was "for the sole benefit of the company." The result was that a supposed water-supply company could operate primarily as a bank, so long as it did a little of its intended water supply. The Manhattan Company raised 2 million dollars. It used one hundred thousand dollars to build a sketchy water supply system, and the remaining 1.9 million dollars to start a bank. 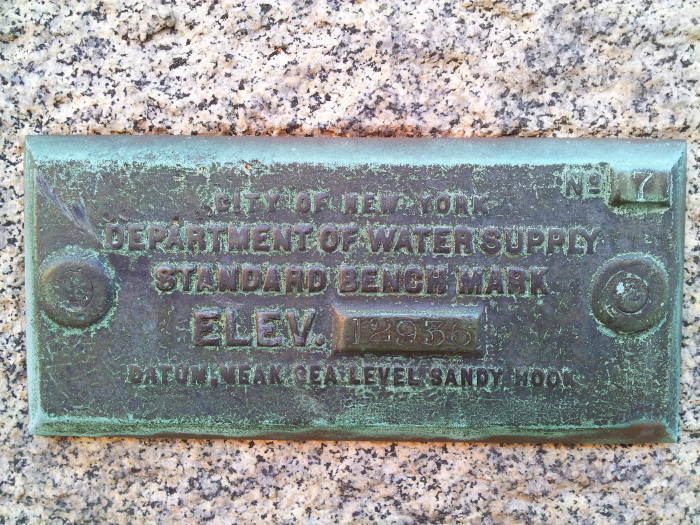 The Manhattan Company never moved any water from the Bronx River to Manhattan. Instead, it dug wells in Lispenard's Meadow, near today's Soho intersection of Broadway and Spring Street. This was a crowded area, where raw sewage mixed with the water. The contaminated water was then carried through a system using hollowed-out tree trunks for pipes. The company sold its waterworks to the city for 1.9 million dollars in 1808. It then dedicated itself exclusively to banking, although it claimed to be a water company until 1899. 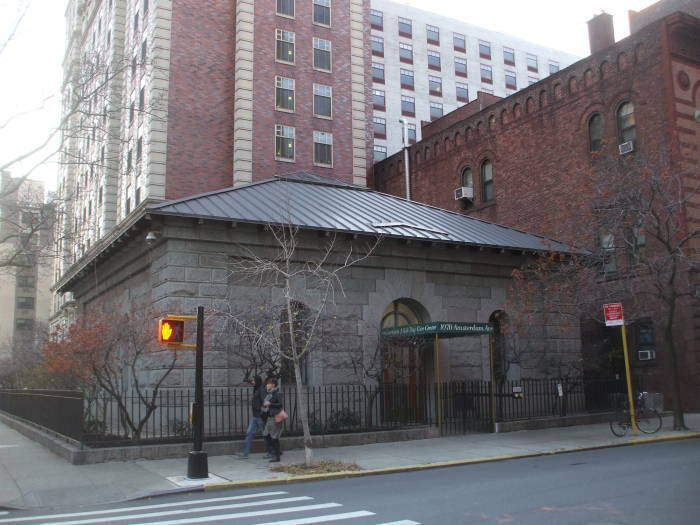 By 1840, the Manhattan Company's purported water system was shut down. The Manhattan Company progressed through a series of mergers and name changes to become JPMorgan Chase & Company, the largest and most profitable bank in the U.S. Meanwhile, the Manhattan Company's original 12 directors included both Burr and Hamilton's brother-in-law, John Barker Church. Church alleged at a private dinner in 1799 that Burr had been bribed in connection with a land development on the western frontier. Burr demanded a duel, and Church accepted. They met at the riverside dueling ground in Weehawken, New Jersey, on the day after the bank opened. Both men missed with their first shots, Church apologized for his remark, and the duel was canceled. Five years later, in 1804, Hamilton had publicly said that Burr was "despicable", a term meaning sexual irregularity at the time. They met for a duel at the same grounds, using pistols owned by Church. Burr shot Hamilton, and Hamilton died. Church's granddaughter later sold the pistols to the supposed "water company" and bank that Burr had founded. The pistols are still owned by JPMorgan Chase. Polluting industries and the lack of sewers had led to a mortality rate of 2.6% in 1830. A cholera epidemic in 1832 was worse than any so far in New York City. Then the Great Fire of 1835 made water supply a matter of physical security in addition to public health. Construction on the original Croton Aqueduct began in 1837. It carried water 41 miles (or 66 kilometers) from the Croton River in Westchester County to reservoirs in Manhattan. It operated by gravity, dropping about 13 inches per mile for a grade of about 0.02%. Water was carried in an elliptical tube of iron 8.5 feet high by 7.5 feet wide, encased in brick masonry. 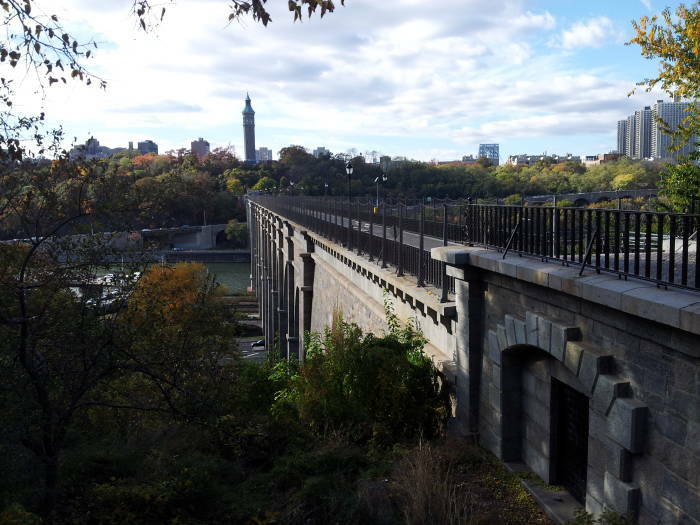 The Croton Aqueduct came into the Bronx from the north, crossing the Harlem River to Manhattan at 174th Street. 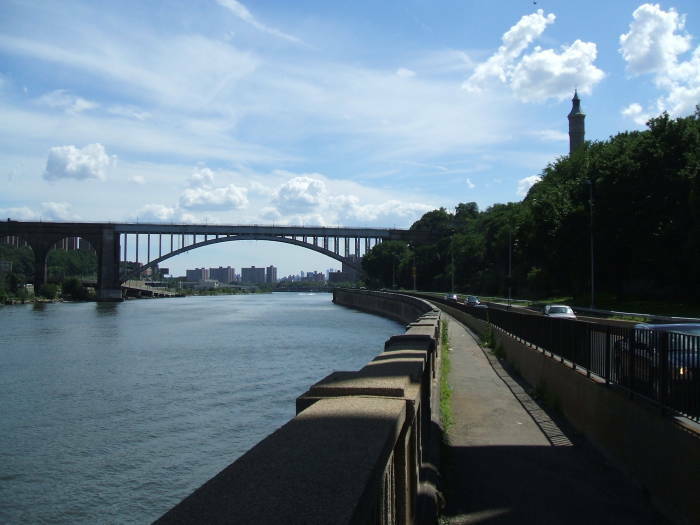 The Harlem River looks like a river, and is named as if it were, but it isn't really a river. It's a tidal estuary or strait, a narrow strip of water separating Manhattan Island from the Bronx. It connects the lower Hudson River to Long Island Sound and the similarly misnamed East River separating Manhattan Island from Long Island. Water moves through it in either direction depending on the current tides and level of the lower Hudson River. Looking north along the Harlem River from the Manhattan end of the High Bridge. Looking south along the Harlem River from the Bronx end of the High Bridge. In the last picture above we're looking across the river to Manhattan. We're looking down Frederick Douglas Boulevard, which becomes Central Park West, which then becomes Eighth Avenue. The one long avenue runs straight all the way down to Greenwich Village. We see a train on the Hudson Line of the Metro-North Commuter Railroad. It started at Grand Central Station and ran north under Park Avenue, emerging above ground at 97th Street. 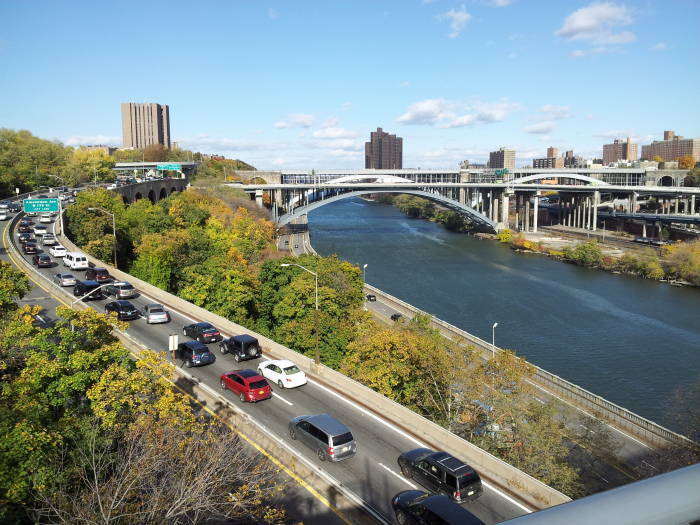 It continues north along the Harlem River. Then it joins the Amtrak line which has run north along the Hudson shoreline from Penn Station. It terminates at Poughkeepsie. The High Bridge was finished in 1848. This makes it the oldest bridge in New York City. 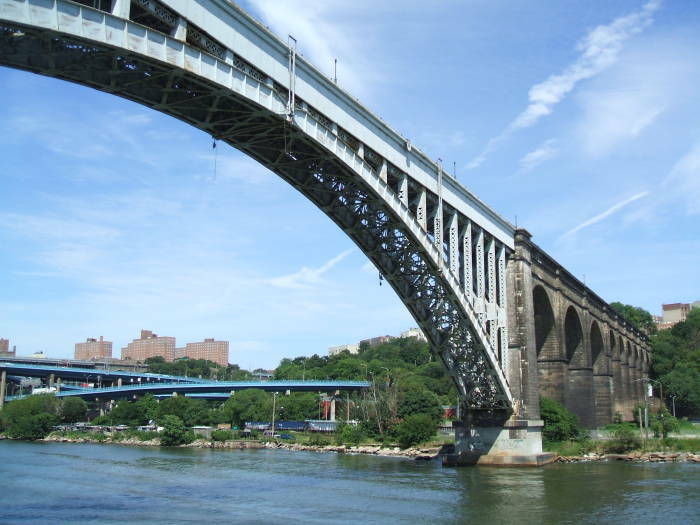 It carries the Croton Aqueduct across the Harlem River. The river is about 620 feet wide at this point, and the land on either side rises steeply. It's especially steep and high on the Manhattan side. The bridge itself is 1,450 feet (or 440 meters) long, with 140 feet (or 43 meters) of clearance above the mean water level. 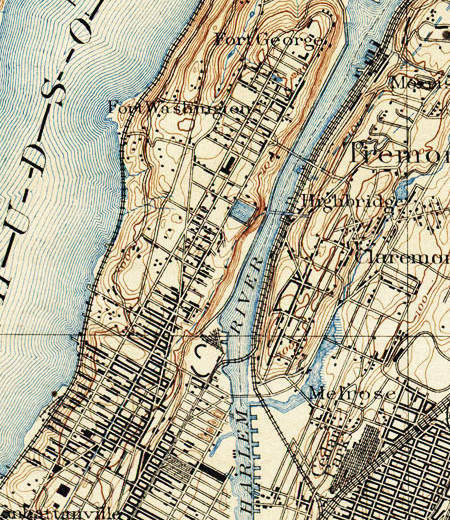 This 1889 topographical map shows the High Bridge crossing the Harlem River from the Bronx to the reservoir in upper Manhattan at 174th Street. Water started flowing through the Croton Aqueduct on June 22nd, 1842. Two years later there were only 6,175 houses connected to the system. However, the new water supply had already improved public health. The city built public bathing facilities. The wealthy included baths in private homes. The public was suddenly drawing much less water from wells. This raised the water table in Manhattan, and many cellars flooded. 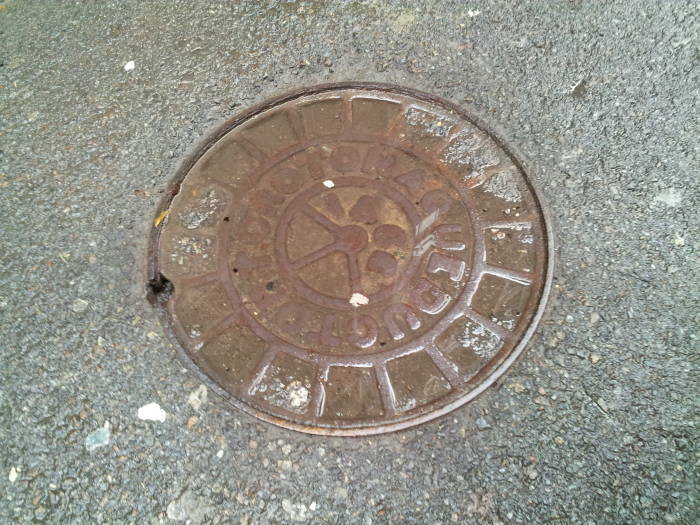 This led in turn to the city building sewers in residential areas. Cellar flooding was worse in the tenement areas, meaning that the city's poor got sewers before the wealthy sections. In 1852, ten years after the aqueduct opened, New York had built 148 miles of sewers. 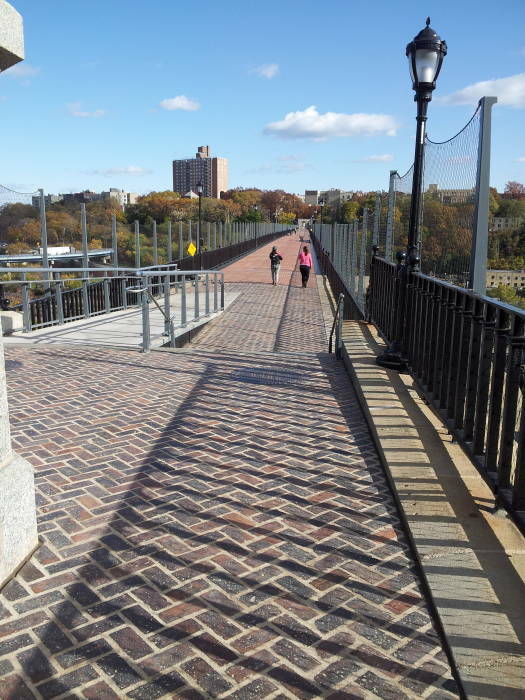 A walkway was built across the top surface of the High Bridge in 1864. It became very popular with the city's residents, who would travel there by train or boat for a day's outing. 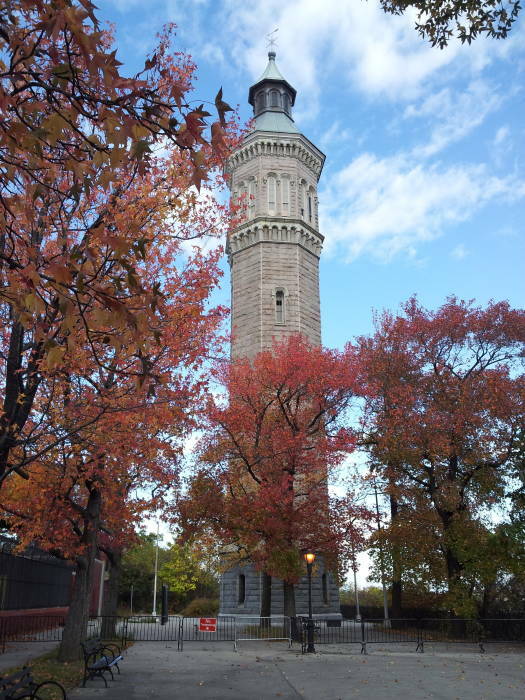 The High Bridge Water Tower was built in 1866-1876. 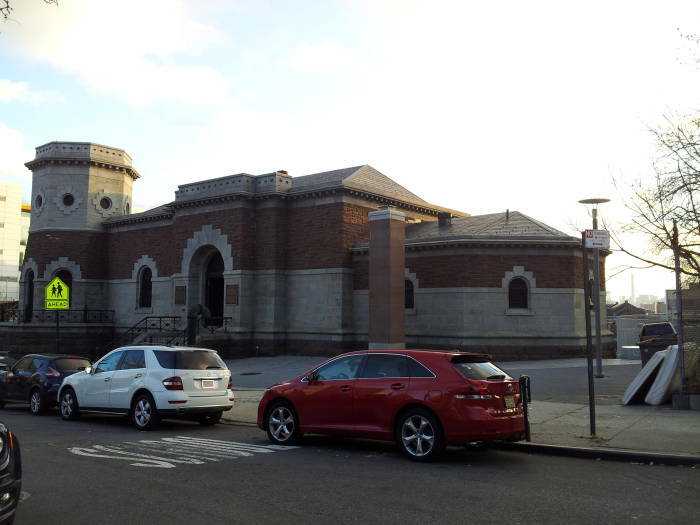 Water was pumped up 100 feet from the Manhattan end of the High Bridge to a 7-acre square reservoir on the east side of Amsterdam Avenue. From there it was pumped up another 200 feet to a 47,000 gallon tank in the tower. This increased the water pressure in the distribution system. I've read that the increased use of flush toilets required higher pressure, and that was why the water tower was built. No, I don't think that's right. Toilets at that time would flush from a tank in back of the seat or mounted on the wall. The increased use of flush toilets would require a greater volume of water, but not necessarily higher pressure. Buildings taller than the typical four to six stories of the tenements have water tanks on their roofs. Water is supplied by below-ground pipes. Electrical pumps then lift the water to the tank on the roof. Gravity feed from the roof provides pressure for all the floors. 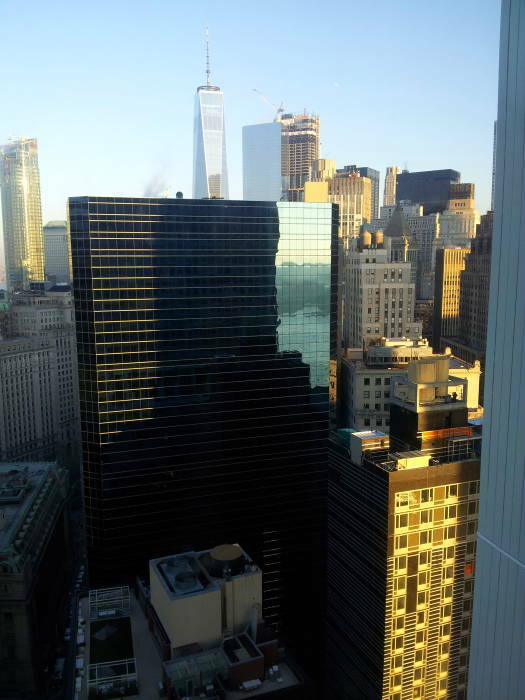 The last picture above is from the 31st floor of a building near the Staten Island Ferry Terminal. Some buildings constructed in the past few years have water tanks with old-style wooden exteriors. Others conceal the tanks within the building. The Croton Aqueduct continued south through Manhattan along Amsterdam Avenue. Gate houses regulated the flow of water along the main line and off into branching supply lines. Three gate houses survive today. The northernmost is on 135th Street just east of Amsterdam. In 1981 it was designated a city landmark, and in 1983 it was added to the National Register of Historic Places. In 2006 it became a theater. 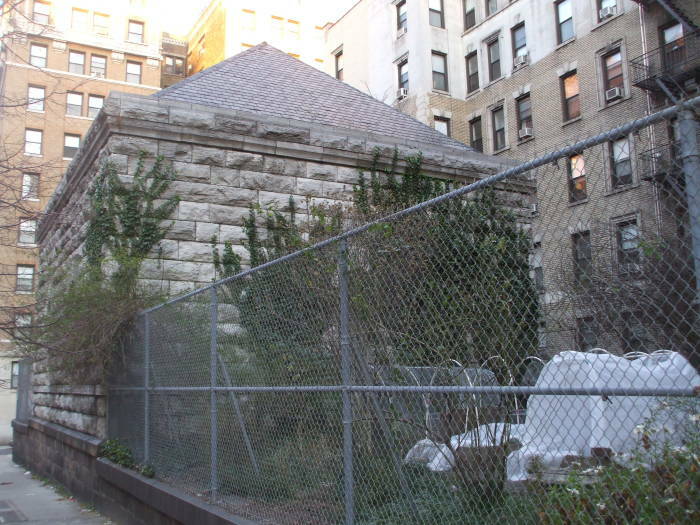 The gate house on the north side of the Columbia University campus, on Amsterdam at 119th Street, is currently unused. The area around it is used as a garden by residents of the adjacent building. 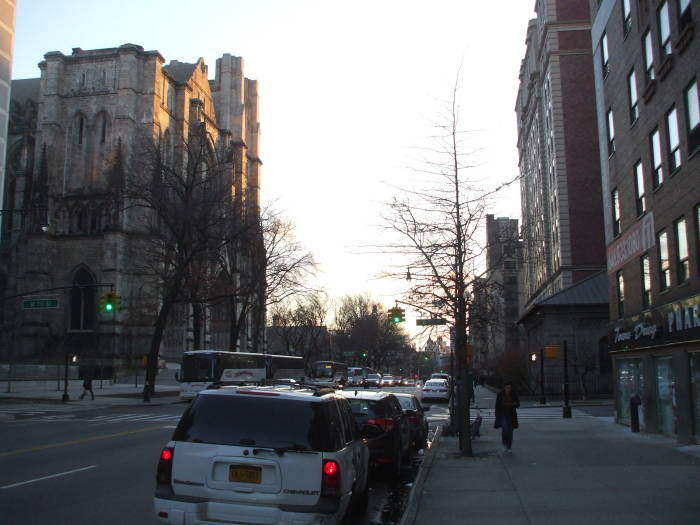 The gate house at 113th Street is across Amsterdam Avenue from the Cathedral of Saint John the Divine. It is now an adult day care center associated with the Amsterdam House, an residence for the elderly. The water flowed south along Amsterdam Avenue, then east a few blocks to the Receiving Reservoir. This was a large tank held within stone retaining walls, 1,826 feet long, 836 feet wide, and up to almost 16 feet deep on average. It was between Sixth Avenue and Seventh Avenue on its east and west, and from 79th Street to 86 Street. 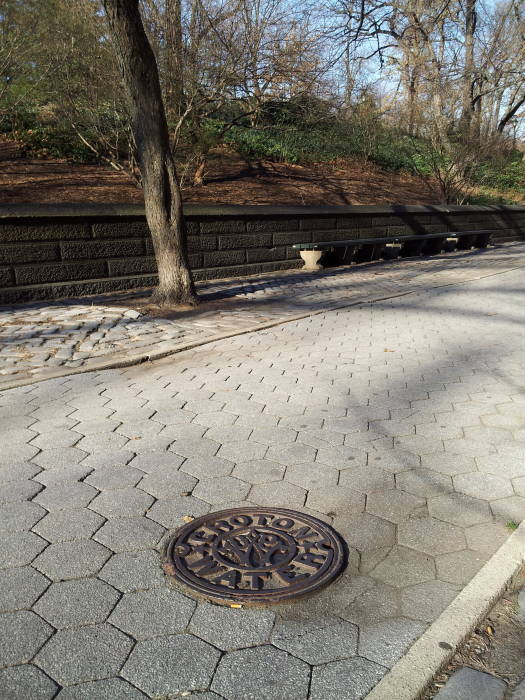 That area is now within Central Park, which extends east-west from Fifth Avenue to Eighth Avenue, and north-south from 59th Street to 110th Street. Water then flowed further south to the Distributing Reservoir, more commonly called the Croton Reservoir. This reservoir filled the space between Fifth Avenue and Sixth Avenue on its east and west, and from 40th Street to 42th Street. Its walls were five stories tall and half as thick, with a broad public promenade around the top of the wall. It held about one-ninth the volume of the Receiving Reservoir. 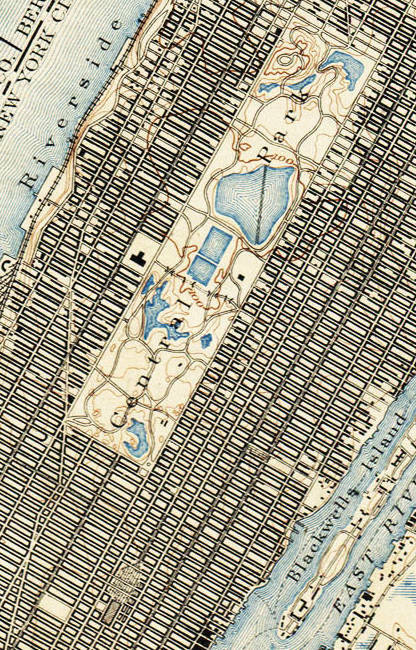 The same 1889 topographical map shows the rectangular Receiving Reservoir in Central Park. The Distributing Reservoir is the small white rectangle just west of Grand Central Station, near the southwest corner of the map. The city kept growing quickly, and the Croton Aqueduct was soon running at full capacity. Construction of the New Croton Aqueduct began in 1885. The new aqueduct, running a few miles to the east of the original and buried much deeper, began carrying water to the city in 1890. The New Croton Aqueduct still delivers about 10% of the city's water. 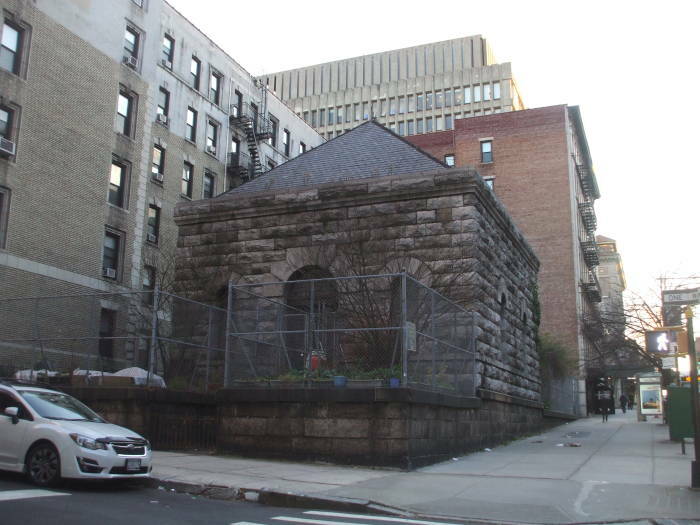 The Distributing Reservoir at 42nd street was demolished in the 1890s. Its location is now occupied by the main building of the New York Public Library and Bryant Park. 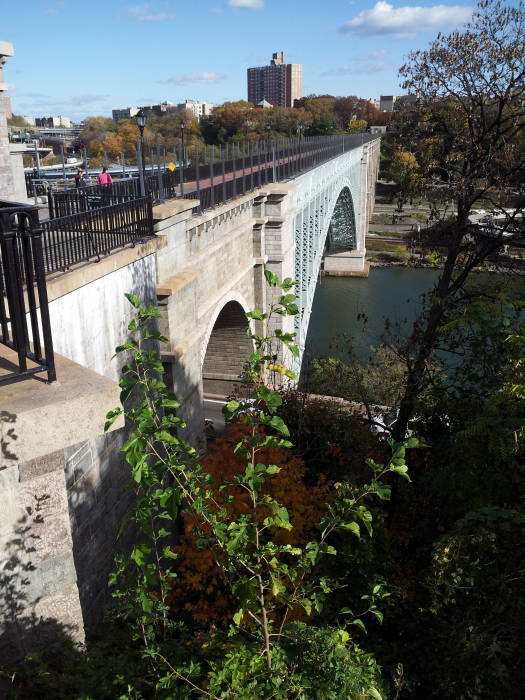 The High Bridge system was shut down during World War I because of a fear of sabotage. The original High Bridge was entirely made up of narrow masonry arches. In the 1920s the U.S. Army Corps of Engineers declared the bridge a hazard to navigation. In 1927-1928 the five masonry arches spanning the river were replaced with a single steel arch about 450 feet (or 140 meters) long. Central Park was established around the Receiving Reservoir. That reservoir was used for the city's drinking water until 1940. It was drained and its retaining walls removed, and its location is now the Great Lawn and Turtle Pond. The Central Park Reservoir, the large non-rectangular body of water on the above map, was built in 1858-1862, and was used as part of the city's drinking water supply system until 1993. Meanwhile the Old Croton Aqueduct remained in service until 1955. 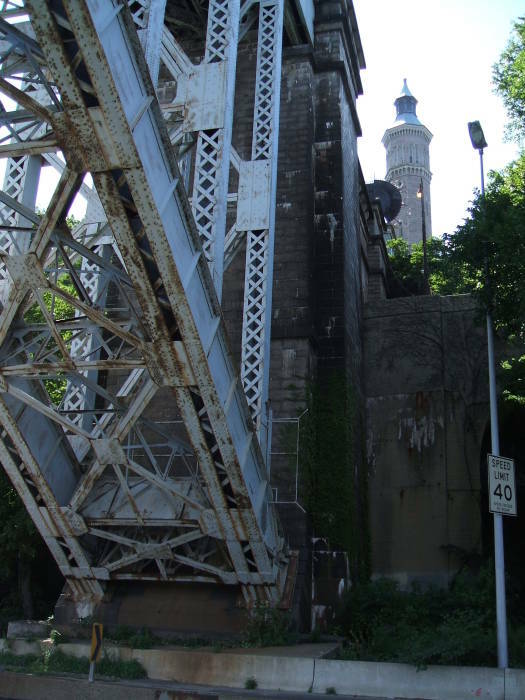 The High Bridge Water Tower was taken out of service in 1949. 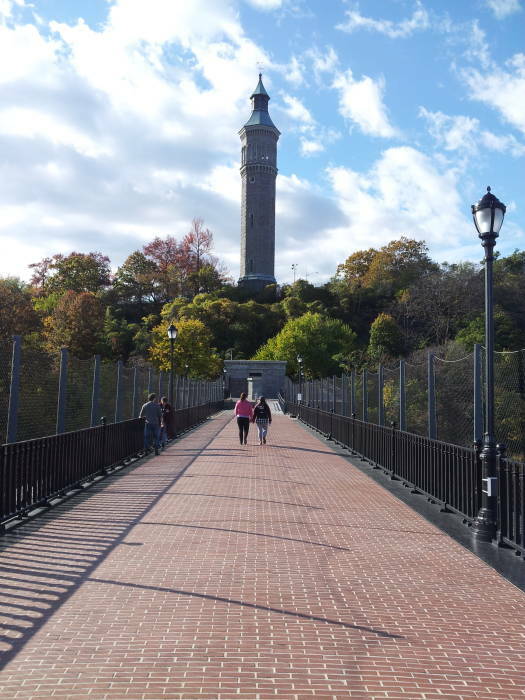 The Old Croton Aqueduct was shut down in 1955, and the bridge was transferred to the Parks Department. The bridge was closed to the public in 1970. It was renovated and reopened in June 2015. 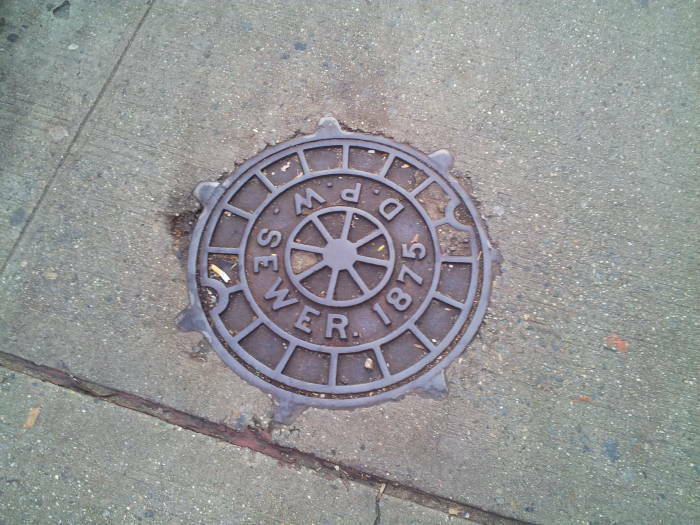 This object from 1866 is said to be the oldest manhole cover in New York City. 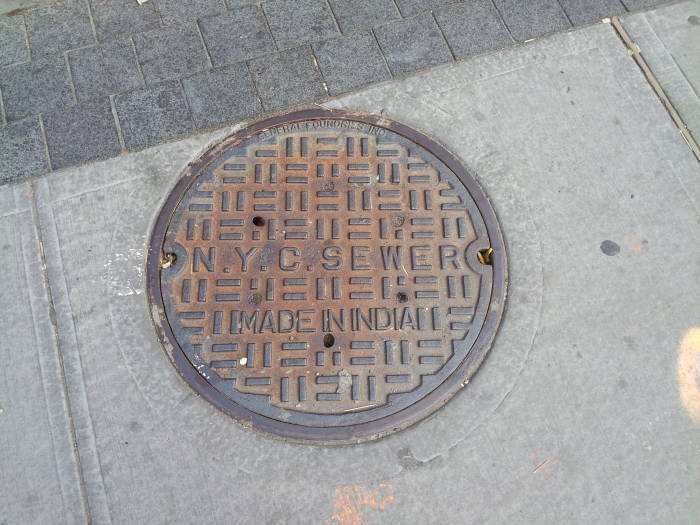 It's in Jersey Street, a block south of Houston Street in Manhattan. Jersey Street is a short one. 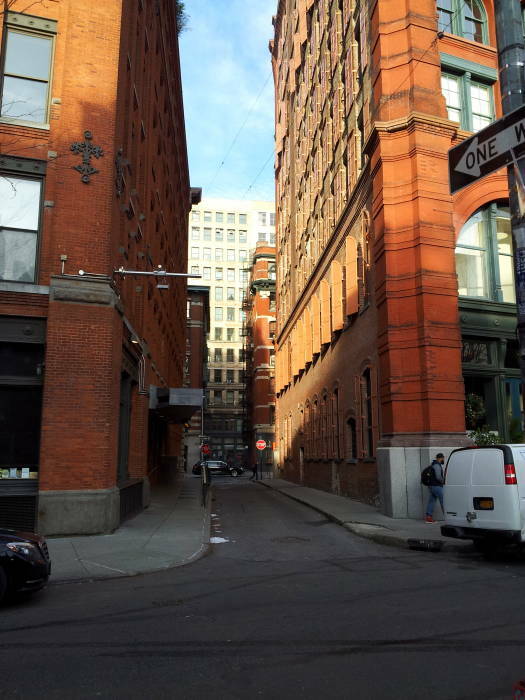 It runs just two blocks west from Mulberry Street, across Lafayette Street, ending at Crosby Street. Below is its entire length. 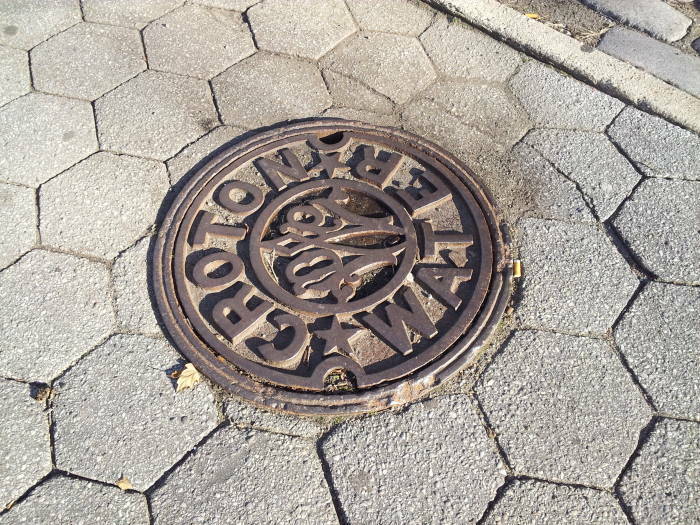 Another manhole cover from the early years of the Croton Aqueduct is along Fifth Avenue, beside Central Park. 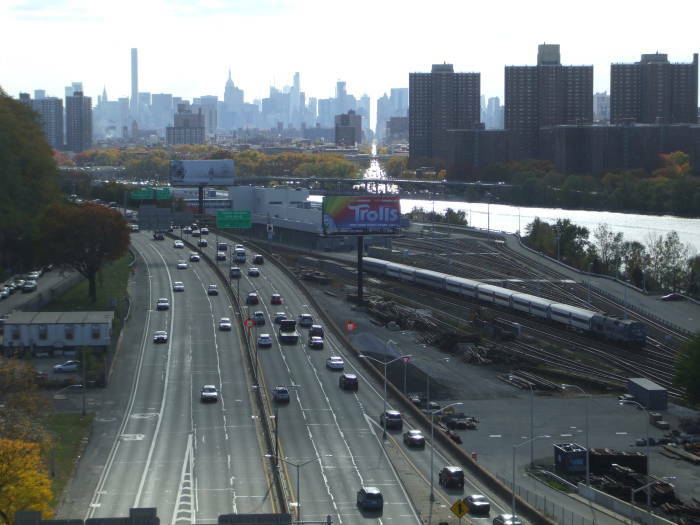 It's about a block south of 101st Street, where 100th Street would be if the Mount Sinai medical center didn't fill the entire area from 101st Street down to 98th Street. The current N.Y.C. 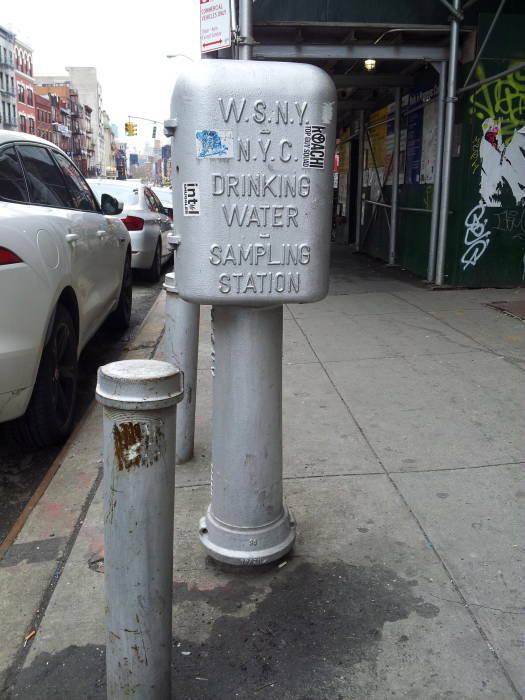 drinking water system has sampling stations scattered throughout the city. This one is in northeastern Chinatown. Health inspectors can use these to test water quality throughout the city.